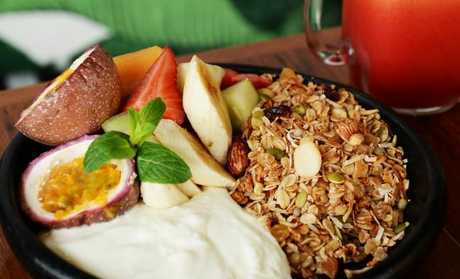 WE HAVE known for some time that the right breakfast plays an important role in weight control. Calorie balance, the right mix of macronutrients and bulk are all important to ensure you strike the right balance. The full factor is also crucial as you seek to cut back but also to not leave yourself too vulnerable to excessive hunger and potential overeating later in the day. So to get the balance right while still supporting your weight loss goals, here are the best breakfast options that focus on keeping you satisfied and fuelled until lunchtime. Eggs are known for their high protein content, which as a nutrient helps to control blood glucose levels but less often do we remember to add in the vegetable bulk known to significantly increase the fibre and nutrient content of any meal. In particular, mushrooms have been shown to bulk up a meal to the same extent as mince, minus the extra calories. For this reason, adding plenty of your favourite vegetables such as spinach, mushrooms, tomato and capsicum is an easy way to get more mileage out of your regular omelet each day. A side of potato or sweet potato will also offer a little carbohydrate to this popular brekkie choice â€" as they do in the US. Toast is one of the simplest and most popular breakfast choices but eaten alone with just a spread means that it offers little for weight loss. On the other hand swapping to a lower carb wrap which can contain as little as a third of the carbohydrates as Turkish bread served with plenty of protein via eggs, smoked salmon or lean turkey and cheese means you have a light, filling breakfast with the 20g of protein known to help regulate insulin levels and as such appetite through the morning. Often forgotten as a breakfast choice for adults, with a single 130g can providing more than 6g of protein and 6g of fibre. when teamed with a slice of wholegrain bread, you have a perfect mix of carbohydrates, proteins and fibre in a tasty breakfast option that is easy to prepare. 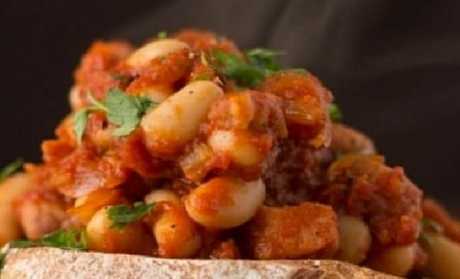 If you are particularly motivated you can also make your own beans and sauce at home which will further reduce the sugar content of tinned beans and sauce. When we think of yoghurt we generally tend to think of the sugary fruit varieties we find at food courts and in delis, and while these are scrumptious they are also ridiculously high in sugars. On the other hand, a single tub of high protein Greek yoghurt can offer more protein than two eggs in a single 170g serve, and can easily be added to cereals, smoothies or enjoyed with fruit to create a high protein breakfast option. If you are time-poor, simply add some wholegrain cereal and grated apple to a cup of Greek yoghurt, sprinkle with cinnamon and leave to soak in the fridge overnight for a delicious breakfast bowl you can enjoy on the way to work. The biggest issue with smoothies is that they tend to be particularly heavy on the carbs thanks to plenty of honey, sweet yoghurt and fruit used to create tasty sweet blends. With the average smoothie containing 7-8 teaspoons of sugar, a smoothie is unlikely to help you full and satisfied for more than an hour or two. On the other hand, if you get the smoothie mix right, with a hearty serve of 20g of protein via a protein powder or Greek yoghurt, a little fruit such as ½ banana along with some berries, some low sugar vegetables such as spinach, kale or cucumber and some light almond or skim milk, your smoothie will have the right mix of nutrients to keep your calories controlled and yourself full and satisfied for several hours. 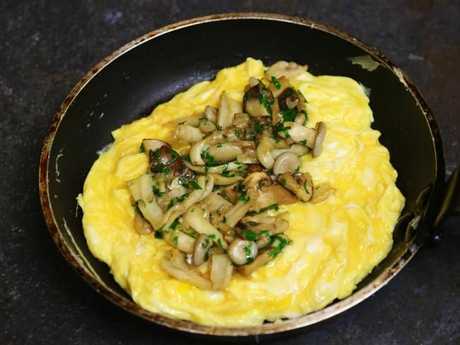 Mushroom omelet is a great source of protein.